After leaving Asheville we rode North and camped in Grayson Highlands State Park in Virginia. It was a nice, quiet night as we began the Mid Atlantic Backcountry Discovery Route. 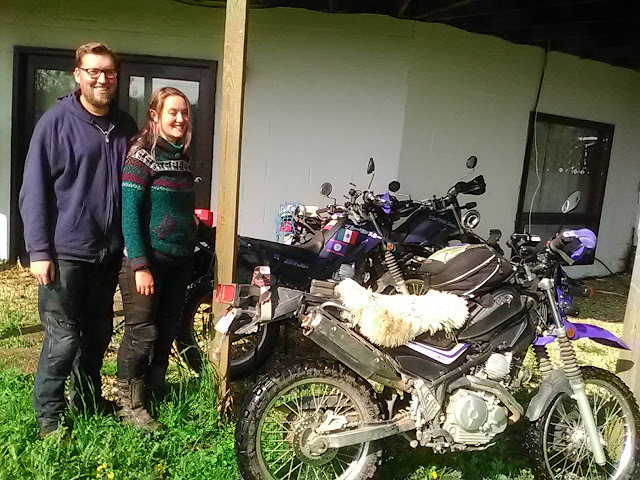 We then rode through a bit of off road trails to the Walnut Flats free camp site where we met a number of other riders doing the route on BMW's, and had a great evening talking bikes by the campfire with them. The next day we rode on and had a great day. But near the end, when we were 2 miles from our campsite, Josh decided to attempt a water crossing. He miscalculated the depth and ended up drowning his bike. This was the first time we've ever had to deal with this, and it was not an ideal way to end our day. While Johanna went to set up camp, Josh drained the oil out and did his best to dry out the airbox. After putting new oil in, it still didn't look great, but we got it to the campsite to keep working on it. While there, another camper approached us, also on an XT250. We meet the coolest people when we have bike issues haha. Jeff had been traveling around the US and Mexico for almost the same amount of time, and helped us get Josh's bike running smoothly again. We spent the rest of the evening enjoying beers around an intense fire. 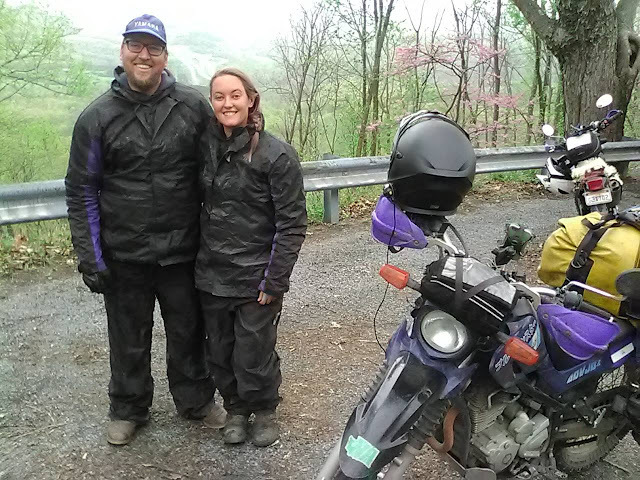 The next day we rode into West Virginia and stayed in the Monongahela National Forest. In the morning we rode a short ways to meet Cloudsplitter aka Dave from ADVRider. He offered to let us stay with him and his family over the rainy weekend. It was great to get a break from the trails and sleep in a real bed. We enjoyed a great time with Dave and his family before continuing North East to York, Pennsylvania. There we stayed with Barry, also from ADVRider, who showed us his great collection of bikes and trophies from his racing days. The next day we rode through lots of historical areas, complete with Amish towns and covered bridges, before camping in the Delaware State Forest, (located weirdly in Pennsylvania). The next morning we rode into New Jersey, and got all the way to the waterfront to see the Statue Of Liberty. From there we went back to an Airbnb that we had reserved in Elizabeth, run by an Ecuadorian family. We had a great time talking about Ecuador with them, and spent the next few days exploring Elizabeth and New York City. While there, Johanna reached out to her job about returning, and hey were ready for her to come back. We were excited to learn of this, but they said she needed to start June 1st. We were faced with a tough decision. We had plans to not arrive back in Washington until July. But we were starting to miss having an income, and in the end we realized the choice was easy. We had one more house sit in Cape Cod before we returned home, so we headed that way. Of course, on the day we left it was raining hard. On the way out of New Jersey, Johanna hit a man-hole cover and her bike went down. She was mostly ok, but we were concerned she may have broken her thumb. We rigged up a thumb brace for her and continued our 2 day ride to Cape Cod in freezing cold rain. When we finally made it Cape Cod, some time off the bikes sounded perfect. We had a week there to check out the beach and neighboring towns, and spend time with some great Old English Bulldogs. Right before we left we secured a 15' Uhaul truck. It had a ramp so we were able to just ride the bikes right into the truck. We then spent the next 8 long days driving from the Atlantic Ocean to the Pacific, stopping along the way to see our friend Rachel in Indiana, Gabe and Teresa in Wisconsin, and Cecilia and her husband Evan in Idaho. We finally got back to Seattle on Memorial Day, and have been working hard on reassembling our home. Our trip ended a little early and unexpected, but trips like these rarely go the way you plan. We had an amazing journey, with fond memories that will last a lifetime. Now for some well-earned rest.